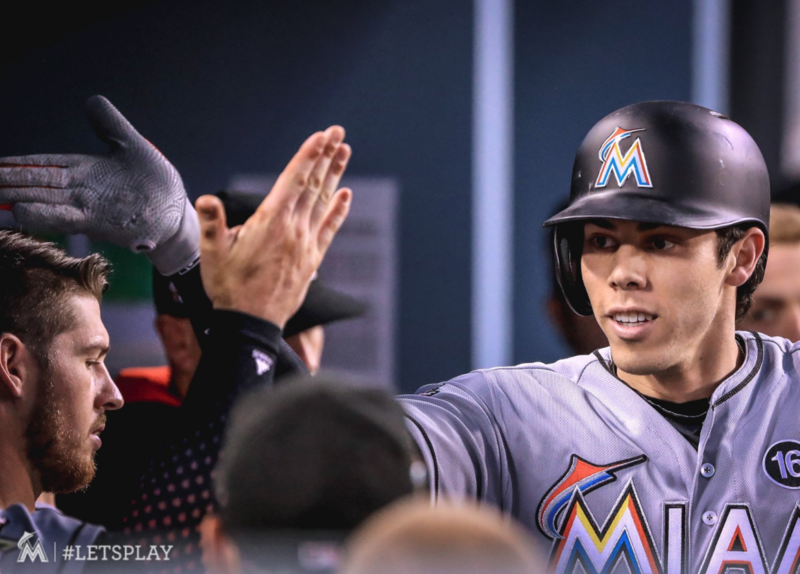 After a really ugly start to the 4-game set, the Marlins were able to split a series filled with homers from our Big 3 as well as contributions from Christian Yelich and J.T. Riddle. We even saw a great performance from our overburdened bullpen. Jeff Locke got absolutely pulverized in the first and third inning giving up a horrendous 11 runs. The bullpen, as you can imagine, was once again called into action, pitching just over 5 innings total. Despite an explosive fifth led by Tyler Moore, Marcell Ozuna and Justin Bour, it is not enough. The Marlins are crushed 14-6. For those wondering, Locke was designated for assignment. The following game, the Marlins got it together showing at the top of the sixth a prime example of scoring when it really counts. 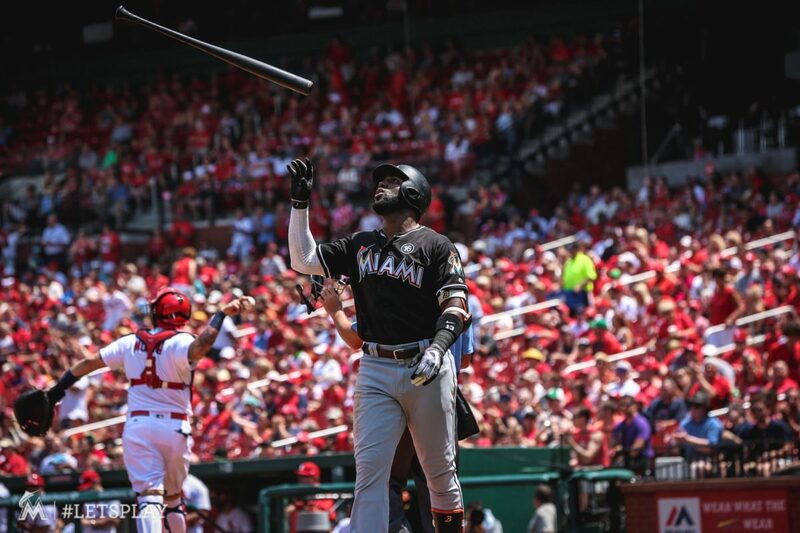 After Stanton hit a laser that was knocked down by Cardinals second basemen Matt Carpenter, causing Dee Gordon to freak out trying to decide on whether to run to third or come back to second, Yelich came up to bat hitting an opposite field deep ball that was going, going, gone! A 3-run bomb. That same inning J.T. Riddle smacked a two-run lefty on lefty single after a Martin Prado double getting Ozuna to third, scoring them both for the 5-2 W.
The third game looked like a blow out when we shot ahead 7-0 in the third, but this is the Miami Marlins they always, and the cough cough Dolphins, manage to keep a game interesting. Even when it’s a detriment to the fan’s health. That same inning the Cards responded with three of their own and things got really crazy in the sixth. Jarlin Garcia walked two straight to load the bases causing rookie reliever Drew Steckenrider to take over, only to have centerfielder Tommy Pham rip a double to make it 8-6. Luckily, we came away with this one too as Bour took away some of the tension with his 19th blast this season. 9-6, Marlins. Edinson Volquez only lasted four innings causing the bullpen to take the long road to victory but despite the situation, they did a great job holding down St. Louis giving up only 2 runs on 3 hits through 5 innings of work. Heading into the series finale we were greeted by another great contest, though this time we were denied the victory. We got ahead early with a single from Ozuna but Cardinals rookie Luke Voit hit a homer and a double scoring all 3 runs logged against Tom Koehler, who went 5 deep. Not bad considering his ERA stands at 8.00. Ozuna for his part scored all 3 of our runs, carrying the offense for the day but the Cards edged us, winning 4-3. Our best chance came in the sixth with 2 outs. Stanton came off the bench to pinch-hit for Koehler with runners on first and second, but Cardinals reliever Matt Bowman took care of us with a force-out at third. Ignoring the lack of quality starts, I was happy with both our offense and bullpen this series, especially the latter. Marcell Ozuna showed us All-Star caliber baseball hammering away 8 RBIs, two doubles and a homer tallying up a grand total of 7 hits in St. Louis. Christian Yelich for his part showed some clutch hitting with a 3-run shot in game two of the series, icing the game for us. He also got a double and two runs. Meanwhile Stanton was already tuning up for the upcoming Home Run Derby with two rockets against the Cardinals, tying him with Ozuna for the team lead in homeruns at 23. He also obtained 4 RBIs as part of his power barrage Wednesday. Coming in at cleanup is José Ureña, who went five innings deep giving up only 2 runs on 3 hits while fanning 7 and improving his record to 7-3 with a cool 3.43 ERA. Our lone legitimate bright spot in the rotation. Prospect Watch: Down at the farm, New Orleans Baby Cakes (What a name) outfielder Brandon Barnes went 3-for-4 with a double (14) and 3 RBIs (34) helping the team dominate Triple-A rivals, the Omaha Storm Chasers 7-0. He’s third in RBIs and second in doubles for the team batting .272. I’m going to be watching this guy along with some others in the coming days. As we head into San Francisco for the final series before All-Star Break, we come to realize we are now in July. The trade deadline is the end of this month. Let’s examine some of the data that is in front of us. We are 8 games below .500 standing at 38-46. We are 12 games behind the NL East leading Washington Nationals and 10 behind the last wildcard spot. Barring a July surge of epic proportions the answer as to whether we are buyers or sellers this trade deadline is abundantly clear. With rumors of Jeffrey Loria looking to begin the team’s fourth ever fire sale to ironically prop up the sales price of the team, fans and players alike are left wondering who will stay, who will go and who will be left when everything is said and done. We can only hope for the best and prepare for the worst. Given the rumors swirling around with the three interested parties still jockeying to buy the Marlins, oh yeah it’s looking like we’re going to bid farewell to a few players. Barring a July surge of epic proportions the answer as to whether we are buyers or sellers this trade deadline is abundantly clear. Shaking off that sinking feeling of despair and ignoring the ulterior motives behind the trades, we are definitely sellers. With nothing readily available in the minor league cupboard, we sorely need to prop up our farm system. It’s part of the reason we had difficulty securing better pitchers in the off-season, particularly during the winter meetings. We have glaring weaknesses in our pitching, weaknesses that cannot be overcome with our dry minor league system. Given such a lack of quality starts from our rotation, besides our pleasant surprise of José Ureña and SOME dependability from Dan Straily and to a far lesser extent Edinson Volquez…the rotation in my eyes as a whole has been a failure. The bullpen for all its ups and downs, has largely performed admirably. In the Cardinals series alone the bullpen accounted for just over 17 innings. 17 innings. Really? Those sort of numbers are unsustainable, leading to a depleted bullpen for subsequent games. And the offense can’t do it alone especially on days where 5 or 6 runs just won’t cut it. And so I’ve come to the conclusion that in an effort to either replenish our farm system or open up some cap space to sign other players in the future, or a combination of the two, we need to send out trade feelers because as much as it pains me to say it, this won’t be a playoff team. We should only look to keep Giancarlo Stanton and Christian Yelich to protect at least some of that core. Stanton purely on the grounds that it will be difficult, though not impossible, to find a team who wants to take on the rest of a 13-year $325 million dollar contract. That and he is the face of the franchise. The players we should definitely be dangling are Martin Prado, whom we just signed to a 3-year deal worth $40 million, Dee Gordon, José Ureña and yes even Marcell Ozuna. According to USA Today, Dee has the third-most expensive contract via total value coming in at $50 million. Despite being 29, the kid still has some years left in him and is definitely a speedster. There is value in that at least to get some decent prospects, if anything to clear some salary cap space. Now that you know what our first and third most expensive contracts on total value are, would you like to take a guess who’s coming in at number 2? Wei-Yin Chen. We signed that guy through 2020 in a 5-year contract worth $80 million. Ouch, can we get a mulligan please? Trading Ozuna would make sense in a very objective manner due to how well he has played, coupled with he isn’t saddled with a gigantic contract like Stanton. We got him on a one year deal at $3.5 million. If we really wanted to, we could grab us a good pitcher or two serviceable starters to bolster the rotation. Or we could use this to grab us some high-tier prospects. The same can be said, though to a much lesser extent, about Ureña (1-year/$535,000). Why trade our only bright spot? We can’t win on him alone, he pitches every 5-6 days depending, and like Ozuna this can be our chance to cash him in. It hurts just writing all this but the strategy is sound. Other players to consider are Derek Dietrich (1-year/$1.7M), J.T. Realmuto (1-year/$562,500) and Justin Bour (1-year/$552,500). Dietrich can replace Prado or Gordon but in the event neither is shipped out, you’ll have to deal Dietrich and move up someone else from the minors as a backup, though you’ll get less. J.T Realmuto has been a dependable backstop and while it would be sad to see him go, we can always resort to A.J. Ellis. And if we’re looking to trade away anyone of the Big 3 without hurting our offensive power, look no further than Justin Bour. The man hits them out of the park with relative ease and was given All-Star consideration despite falling short in the final vote tally. Not to mention, he has a very capable replacement waiting in the wings in the form of Tyler Moore. We gotta face facts, and the fact of the matter is this team is likely heading into rebuild mode unless the baseball gods give us a hell of a July. But even then, it would just serve to raise the value of our trade bait and advance our dastardly owner’s aims. We can only wait and pray. Until next time, stay frosty. Stat of the Week: 28 2/3. To hammer this home, the bullpen in the span of a week has logged in a little over 28 innings, including the Brewers series. If the planned roadmap for the starting pitching was followed, the 6 inning minimum with the assumption you won the road games, the bullpen should have only put in 21 innings of work. We go way over. Views from the Cheap Seats is a biweekly segment where a Miami raised sports nut recaps, screams and analyses a week’s worth of games giving a toast, or the finger, to his hometown team depending on their performance. A truly hopeful but always realistic fan putting thoughts to pen to paper and always striving to improve. Be bold, be good, be you. Just an avid sports fan who happens to have a love-hate (mostly love) relationship with his local teams be it collegiate or professional and also happens to be a news junkie. Mix in outstanding optimism with cold realism and you've got yourself a balanced cocktail perfect for champions.